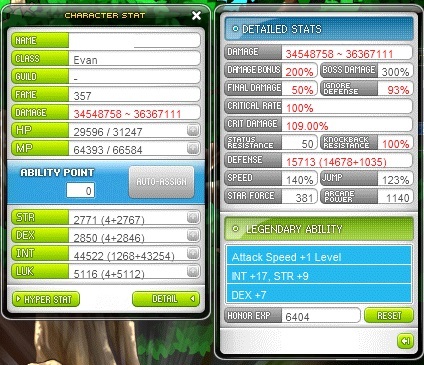 Level 250 Evan on reboot. Also started second main on a night lord, never ended up getting that far with it though. Level 208 with pretty much full legendary gear with over 2m range. Has a level 150 farming kanna. Level 230 Kanna - all the gear was sold off from it, still has a couple of untradables items such sweetwater accessories and sweetwater fan. Also has some perm NX still on it along with it and a bunch of random items. Level 205 Wild Hunter - Has some legendary and unique gear. Sitting around 1.5-2m buffed range. Was a project I started a while ago but never really finished. Has good beginnings.